Crafted with a chic rose gold groove, this elegant two colour palladium and 9ct rose gold ring is perfect for your big day. 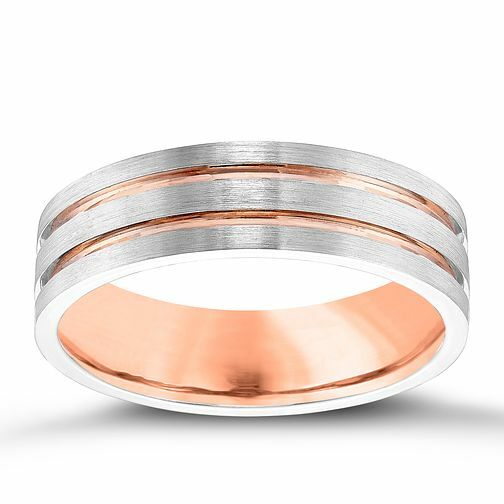 Men's Palladium & 9ct Rose Gold 6mm Band is rated 5.0 out of 5 by 1. Rated 5 out of 5 by Anonymous from Wedding Ring I bought this as a wedding ring for my husband. It's really stunning the palladium has a brushed effect so its not easily scratched and the rose gold on the inside catches the light. My husband lost the first ring on our honeymoon and we bought this ring again as he liked it so much.